Pamela Cantor, M.D. 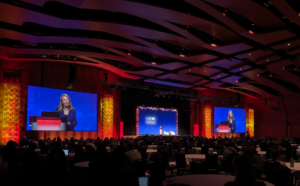 gave the closing keynote at iNACOL Symposium 2018 in Nashville, TN. Her presentation, The Power of Whole Child Personalization: Connecting Science, Learning and Human Potential, focused on how research and practice can help design schools that support personalized learning for the whole child. During the presentation, Dr. Cantor introduced Turnaround’s Building Blocks for Learning, a framework for comprehensive student development, and shared insights from two papers she recently co-authored in the journal Applied Developmental Science which synthesize research from multiple disciplines into a set of scientific principles that can be applied today, to enable many more children to achieve and thrive. Dr. Cantor used these principles to address the interconnected relationships between school system design, adult mindsets and skills, and the intentional support of successful learners – translating this complex body of work for practical use in schools. The goal: whole child personalized learning and the use of developmental principles that can and should be applied today to support innovations in school design and practice. Dr. Cantor demonstrated how we can harness this scientific knowledge to design educational environments that promote the development of the brain, accelerate learning and drive holistic student development so that all children achieve to the fullest expression of their potential.